Russia is growing its popularity as the tourist destination, thanks to FIFA 2018 World Cup Event. Many places that didnt get attention till now is getting more attention than ever. Many tourist and traveler now have a bigger interest travelling to Russia and visiting their many tourist spot, from mountains area to the sea Russia have an amazing scenery which will make your mouth open in awe. Now you might have a plan to have a vacation in Russia, but you were bewildered by many tourist destination in Russia. You also don’t have a time to visit all of them, so where will you choose? what is the best destination to go? should i take more paid vacation? Don’t worry, cause I have a suggestion for you, if your hometown is a big city you may consider to visit small town in Russia. The small town in Russia offers you many amazing experience from scenery to their food. Below is a guide to 10 best small town to visit in Russia, but before that you may also consider your preparation before considering to visit there by reading “Effective Tips To Do One Week Trip To Russia With Carry On Luggage”, or If you weak to the cold weather there is also a guide to prevent you going there in “7 Coldest places in Russia” now that’s done here is the suggestion for visiting small town in Russia. Dargavs also known as the city of the dead is also one tourist spot you need to go for once, more so if you have adventure spirit, although the long and tough road plus the scary atmosphere in cemetery could make you reconsider your choice but Dargavs have many places that are interesting to see. For example, there is a myth in which if one dared to walk in cemetery they would never come out alive. also if you interested in tombs and crypts there is also Alanian necropolis which comprises of 99 different tombs and crypts. and you could visit the tomb for exhilarating experiences. Small town Kirishi serves as the administrative center for Kirishi, you will find many cultural and historical heritage to commemorate the events of World War II, you will also find many oils and chemical industry here. But, the number one place you should visit in Kirishi is it Church of the Nativity of the Blessed Virgin also known as Stroganov Church. you could appreciate their architecture and the quietness of the places which induces peacefulness. Searching for small town sometimes will be boring but not in Suzdal why? its a small town surely, but Suzdal also is one of the towns in Golden Ring Town group. Suzdal has many interesting landmarks to note like The Kremlin, St John the Baptist Church, Intercession Convent, Saviour Monastery of St Euthymius and last but the most important places are Togovaya Ploschchad. You could find souvenirs such as Russian Matryoshka doll, or buy fur hat for cold weather in Russia. Even better there is also a homemade item such as Medovukha. Also, if you want to experience a cultural tradition or just want to experience a festive mood, you better plan to go there on the second Saturday. Suzdal holds Cucumber day festival every year at that time. With many interesting things to do in Suzdal, it is obvious why it also on the list in 10 best small town in Russia as you will really regret it if you didn’t come by. After going to Suzdal, you might also try Rostov next. It is one of towns in Golden Ring, also one of the oldest in the country of Russia. What’s more, it also has many historical building and architectural monument there. The town has a cozy atmosphere, and nowadays people go there for its Museum. Many treasures of Russian natural culture is being held in there. You could also take a walk to the Uspensky Cathredal and enjoy the scenery above with its architecture. Cultural geek or affectionate that enjoy seeing cultural differences should also go to Tikhvin, its located in Leningrad Oblast, and situated near St. Petersburg. Tikhvin also serves as the cultural and industrial center of the Tikhvinsky district in addition to the administrative center. You could travel from St. Petersburg using trains or bus. In addition you could find many attraction such as Tikhvin Monastery of the Mother of God, Rimsky-Korsakov House-Museum. Also, the restaurant here is quite good and you must try at least once if you ever come by. Its called Istoriya, it boasts country charm when you go inside and it provides you with decent food with Russian classics like pelmeni and borscht. Historical town Georgiyevsk is known for its history obviously, it is situated in the southeast of Stavropol city. There are many places you should visit, from the old city hall which has bell tower from 20 century to town museum building in town which called Dara. If you want to go searching for fur related items Georgiyevsk is the right places. It is also one of the biggest centers in Russia, selling an item made from fur. You could also find Russia local wine which called Georgiyevskaya krepost if you are wine affectionate. A recommended small town that for people searching for a quiet places in some beach. With the dissolution of Soviet Union this city made an improvement on its popularity for tourist as a beach resort. Anapa also has an airport which mean you could go there from Moscow. In this town your goal is to take a rest and enjoy superb summer climate and enjoy its scenery along with its sandy beach, it is the right alternative than going to Sochi if you want more of quiet places and traditional feels. Going to visit Gelendzhik after you enjoy Anapa is also alright. Even though Gelendzhik is also a resort town, they offer you different experience you will never get in Anapa. The difference from Anapa mainly because of facilities issues. You able to choose to go to Aquatica water theme park for water entertainment, or Monument to Lermontov. Formerly known as Krasnoarmiisk now changed into Pokrovsk because of political reason. This place will be your next visiting destination, it serves as the administrative center of Pokrovsk Raion. it has many wildlife attraction from snowmobiling or ice fishing. Not only that, but you could also go partake in any winter sport. For people that like to shop, or just eat. The local products or cuisine in Pokrovsk also offer you with many specialties. Cuisines cooked with rye and oats as it usual ingredient they use. There is also Lymonnyk or Lemon pie that fit your craving for foods. Island town Sviyazhsk is located near the river Sviyaga and situated 60 km from Kazan which one of the largest city in Russia . while Kazan is indeed big, the same cannot be said for Sviyazhsk. as it is an island town, it has many historical monument such as Cathredal of icon Mother of God which build in 1898, or Civil War Museum. 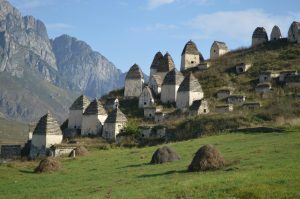 Coming to Sviyazhsk you will also experience a peaceful and unique scenery thanks to its beauty. You will also feel comfortable and relaxing being there. And that’s all of the 10 Best small towns to visit in Russia that is recommended if you ever plan to travel to Russia, then you could consider at least to visit 5 places above. all in all, if you ever travel to Russia it best if you could befriend Russian people as it will get you richer and warm experience there even better to pick up some woman there. lastly, whenever you will be going there I hope you safe travel and enjoyable trip by making use of this guide.